If you’ll allow me to be crude for a moment: more often than not, gods are dicks. They’re narcissists and sociopaths. They crave your worship and don’t think twice of smiting you if you displease them the teensiest bit. They like a spot of sacrifice, ideally of the human kind – the bloodier the better. Whoever thought it was a good idea to give such hypersensitive, overpowered egomaniacs with the maturity of toddlers even the slightest bit of power? What’s that you say? We did it? By believing in them, we invested them with power? Nope, I won’t be doing any lists. No “Best game that gamers feel insulted by, saying it’s not even a game, like!”, no “Best instalment of The Hobbit to date, even though it wastes Mikael Persbrandt” and no “Best mildly disappointing new League of Extraordinary Gentlemen comic”. Just one entry. Or should that be entrée? I’ve written about Hannibal before. It’s rare that my pre-release expectations of any media product are this different from my opinion of the result: when I heard that they were doing a TV series based on the Hannibal Lecter books by Thomas Harris, I scoffed audibly. Cannibalistic cash cow, anyone? I was wrong, though: Bryan Fuller and his band of assorted sickos, psychos and gourmets have created one of the most fascinating series in a long time. It’s no The Wire, Deadwood, The Sopranos or Six Feet Under – but neither does it suffer from that comparison. It’s something entirely different, and it’s remarkably different from the films based on Harris’ novels. There’s obviously an element of Grand Guignol in the artistic killings of the series, but at the same time we’re not supposed to titter and gawk at the imaginative imagery. Fuller puts a sense of terror and downright, metaphysical dread back into that most hackneyed of fictional figures, the serial killer. Much of the credit must go to Fuller’s two leads. I expected Mads Mikkelsen to be good, but he’s better than I’d dared to expect. He is miles away from Anthony Hopkins’ increasingly hammy Hannibal: a cold, calculating, diabolical and utterly fascinating creature, one of the reasons why Hannibal freaks me out as much. 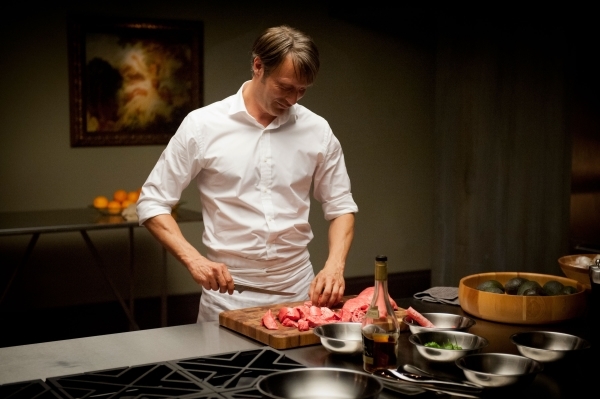 If Hopkins is theatrical in his camp evil, Mikkelsen’s culinary villain offers a much more intellectual, sharp-as-a-knife theatricality with no hint of a wink at an audience that despite themselves roots for that darn rascal Hannibal. Will Graham, played by Hugh Dancy as a permanent bundle of frayed nerves sending messages of pain to a fevered mind, could have been the boring straight man, but instead he offers the much needed polar opposite to the series’ Hannibal Lecter. His humanity could have been boring, cloying or preachy, but Dancy brings a taut, nervous energy to the role that is constantly interesting, always watchable. The rest of Hannibal‘s cast fares well, but it’s Dancy and Mikkelsen that make it work – together with the cinematography, that is, which manages to balance fascination with repulsion with a deftness I can’t remember having seen in a long time, and definitely not in any of the post-Silence of the Lambs serial killer movies. There have been other interesting, worthwhile media events in 2013, but nothing has captured my imagination and haunted me as much as Hannibal, and for that I owe Bryan Fuller a dinner, at least. He may just be the main course, mind you. And on that yummy note: wishing every one of you a very happy 2014! Except you. No, the other one. Yes, you. Sorry.